Spectra Trifecta Brewed to Benefit ArtPrize 2015 - Founders Brewing Co.
Posted on July 21, 2015 by Founders Brewing Co.
We’re excited to announce that we’re going to release Spectra Trifecta, brewed in the traditional Kolsch style, this September. Proceeds from the sale of this new beer will benefit ArtPrize, the world’s largest art competition that takes place annually in Grand Rapids, Mich. Spectra Trifecta will be sold in 12 oz. bottles in Michigan, Wisconsin, greater New York City and greater Chicago with a suggested retail price of $9.99 per 6-pack. Draft will be sent throughout Founders’ distribution footprint. In April 2013 the two organizations inked a deal that made Founders the official brewery of ArtPrize for the next five years. The premier leadership sponsorship deal included offering Founders beer at all official ArtPrize events, signage, promotion, merchandise, specialized glassware and other items. It also included permission for Founders to use the ArtPrize identity marks (logo and graphics) on any co-packaged items, including beer. 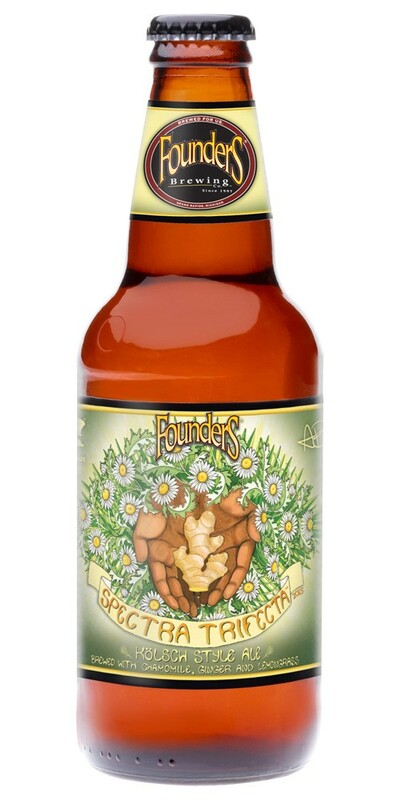 Founders expects to release a new beer for each year of its five-year partnership with ArtPrize under the name “Artist Series”. This is year three. Last year’s release was Mosaic Promise, and the 2013 release was Inspired Artist Black IPA. Brewed in the traditional Kolsch style, which requires fermenting ale yeast at a colder temperature and gives the beer a clean finish without fruity yeast esters. This bright, golden beer is brewed with a trifecta of natural ingredients: earthy, floral and slightly sweet chamomile; a touch of citrusy lemongrass; and a hint of spicy fresh ginger. At 5.9% ABV and 20 IBUs, it’s delightfully refreshing. Founders Family members were given the opportunity to submit their portfolios to find an artistic match for the Spectra Trifecta label, without knowing anything about the beer. Alexis Brooke’s nature-inspired pen and ink drawings fit well with the character of this beer, so she was selected to create the label, with a focus on illustrating the beer’s special ingredients. Alexis is a Grand Rapids native and has been a Founders employee since fall 2014, working in the deli and on the catering team. She’s a musician first, with a passion for singing and playing the blues, and has played a couple of shows in the Founders taproom. But Alexis has drawn since she was a kid. A self-educated artist, Alexis is inspired by nature and a deep love for animals. She created this mixed media piece with markers, ink and watercolors. Proceeds from the sale of Spectra Trifecta will support the future programming of the ArtPrize organization. ArtPrize is an international art competition, open to any artist and decided by public vote. Its mission is to promote critical dialogue and collaboration through new, creative ideas among a large and diverse population of people. As an innovator in redefining what beer can be, Founders believes that experimentation is central to the human experience—whether one experiments with grains and hops or markers and watercolors—and that sharing one’s creation with the public is a brave act worth celebrating. More than 400,000 people are expected to attend ArtPrize Seven this fall. Founders also partnered with ArtPrize to launch ArtPrize on Tap, now in its second year. From the patios of the Centennial Room, Founders’ private second-floor entertainment space, ArtPrize on Tap offers ArtClub members the opportunity to connect year-round and stay on the ArtPrize insider track, while enjoying Founders food and beer. Founders will premiere Spectra Trifecta at the August installment of ArtPrize on Tap. Held on the third Wednesday of every month, ArtPrize on Tap is free for ArtClub members, and friends of ArtPrize and Founders can join for $10. To learn more, visit artprize.org/artclub. Spectra Trifecta will be available for a limited time starting on Sunday, September 13, in Michigan, Wisconsin, metro NYC and Chicagoland in bottles and across Founders’ entire distribution footprint on draft. It will be released in the brewery’s taproom on draft and in bottles starting on Monday, September 14. Spectra Trifecta will be featured at official ArtPrize events. This year marks the seventh edition of ArtPrize, which will take place Sept. 23–Oct. 11, 2015. The Founders taproom will be a venue for the seventh year running. Sounds good, would love some more Mosaic Promise too! Cheers! And glad to hear you enjoyed Mosaic Promise!